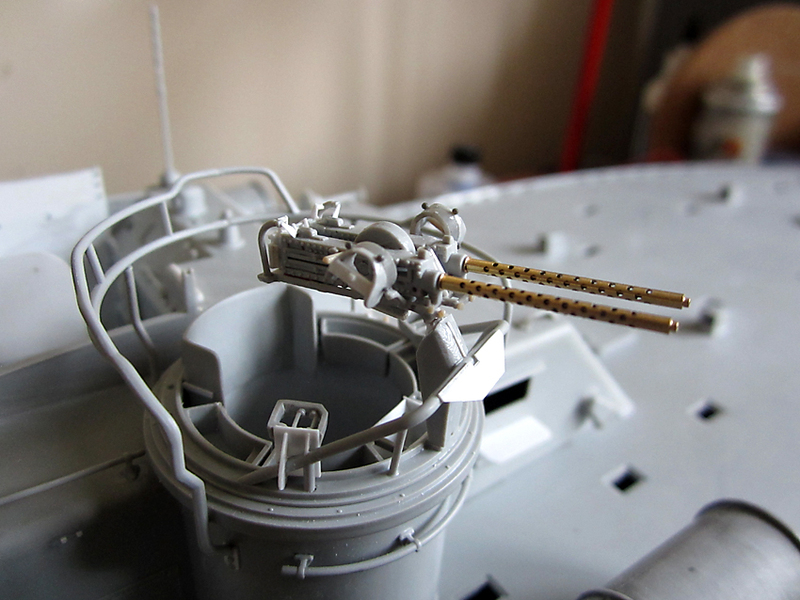 The turrets are important focal points so cry out for extra detailing. 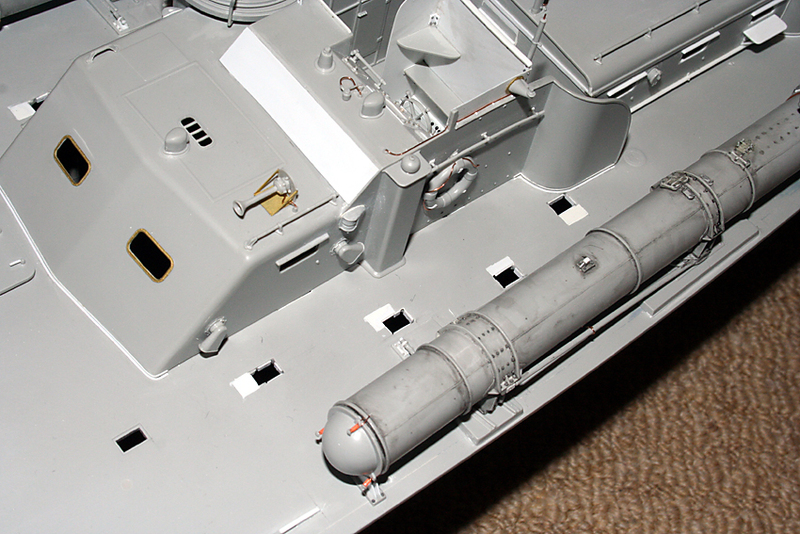 I had previously filled in the open areas inside the turret barrels with card, and adjusted the angle of the rear turret lip to match the plane of the front gun ring. The first task was to assemble the rear depression rails and check the fit. 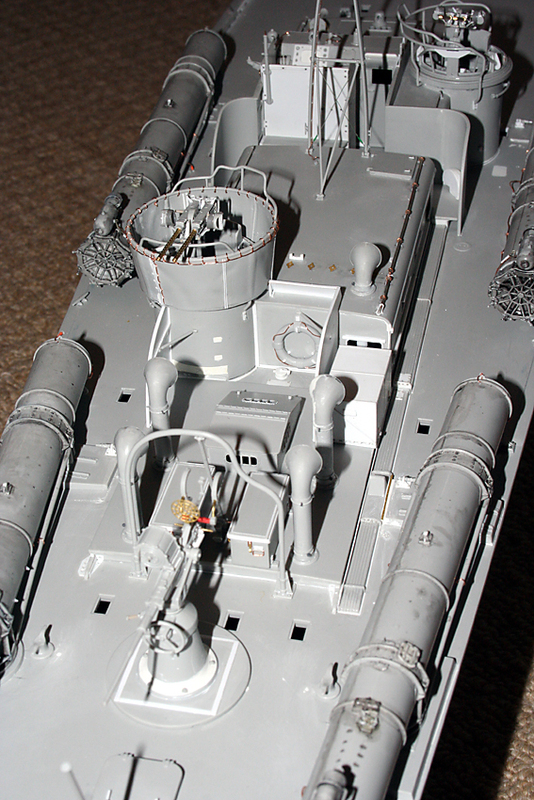 Having adjusted the angle of the rear gun ring, the depression rails were now tilted too far forward so I cut off the rear mounting points and replaced them slightly lower down and detailed them with rivets. The cut-out in the stbd. windshield also needs to be to be enlarged because of this. 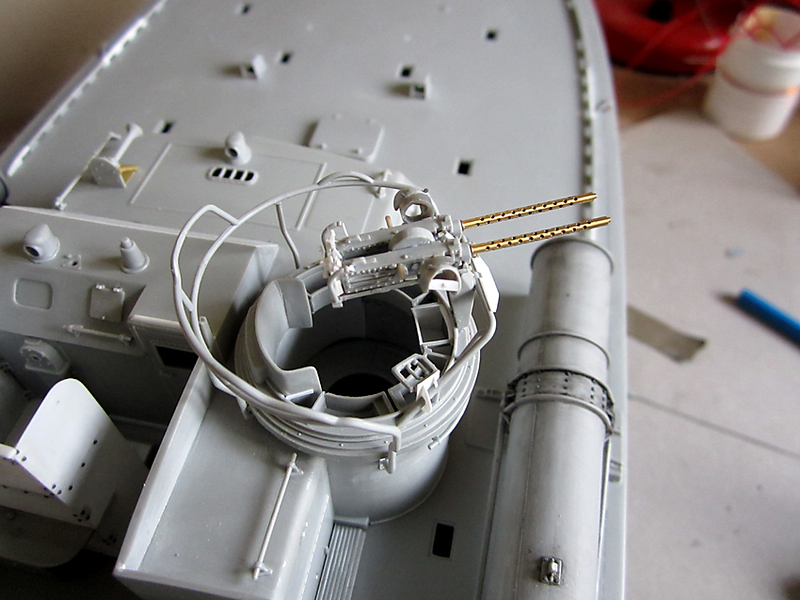 Italeri provide moulded on detail to represent the lacing around the turret spray shield, but I decided to enhance this feature with wire. Some fabric seam detail was also added from strip. When the spray shield assembly is joined together it will not fit over the gun ring so this needs to be added afterwards. The front depression rail was checked for fit and I found that it needed some trimming to get it to sit correctly, but this may have been just me. 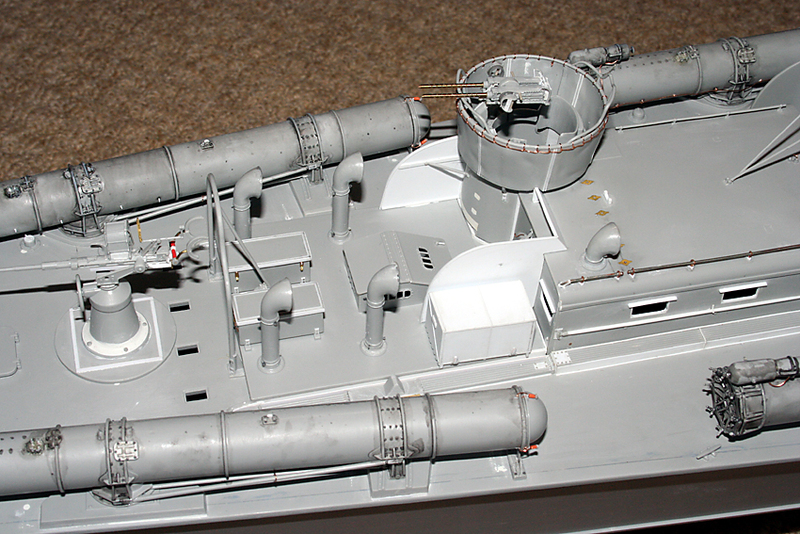 With these assemblies completed I then started on the .50 cals. 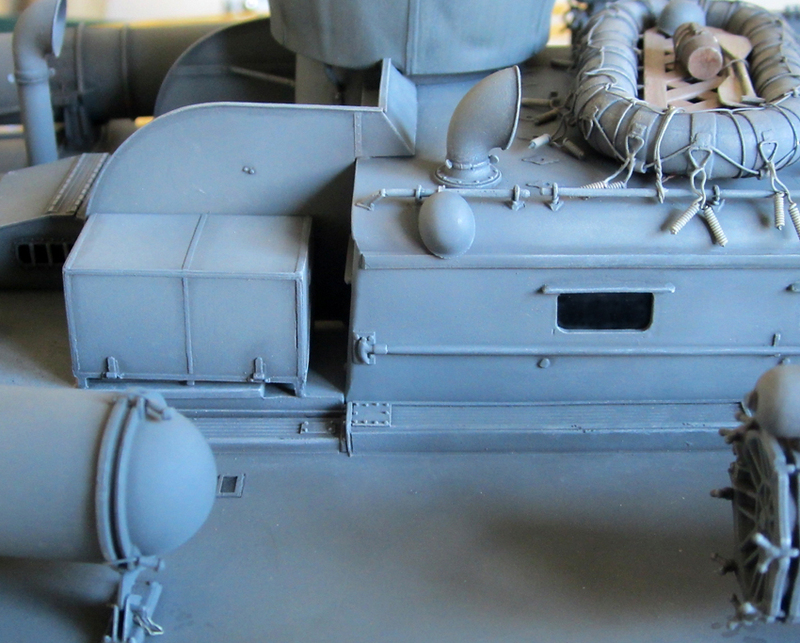 The rotating turret bases are moulded in one piece and so are a little simplified. There is a fair amount of work required to eliminate the seams, but when all is cleaned up they look quite good. The ammo feed guides above the ammunition boxes are a little clunky, so I thinned them out and replaced the mounting plates. There are no covers for the ammo bins, I plan add these at some point. The spent case chutes are missing, so I made some up from card and also added some detailing around the rings. 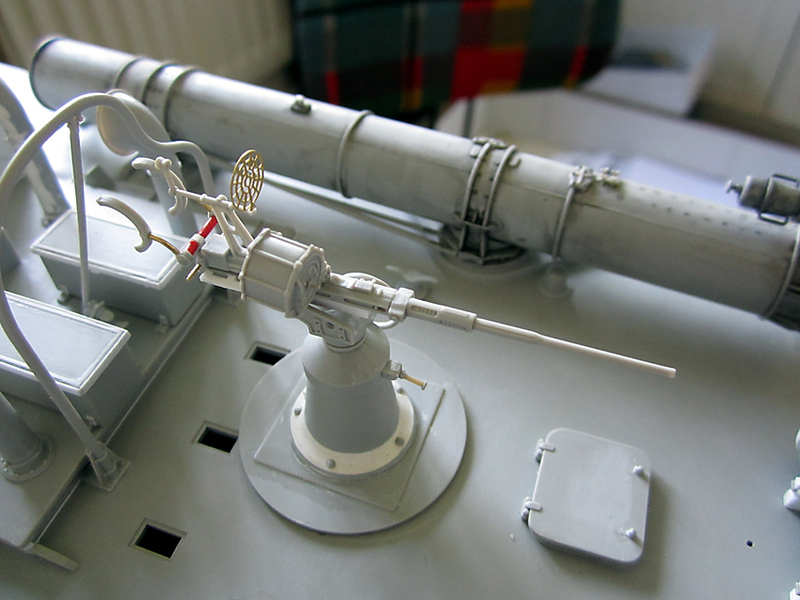 Apart from the charging levers, the guns are nicely rendered, only requiring a cleanup. I did however, replace the barrels with drilled brass items. There is no representation of the trigger plates so these were scratchbuilt, and shock absorber and other detail added to the gun cradles. A slice of rod needs to be added to hide the pivot pin. 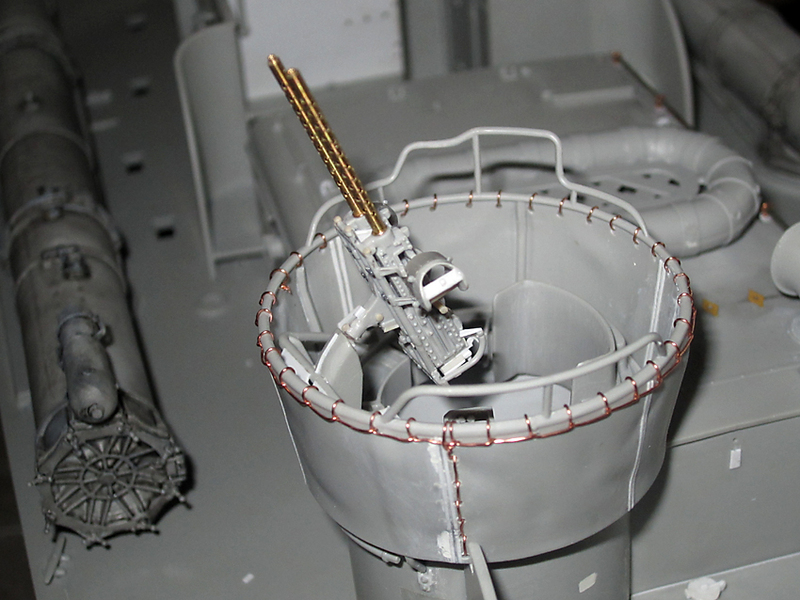 The gun feed guides are simplified, and the way they mount on the cradle is not quite correct. The guides were in two parts, with a fixed collar on the gun cradle and an outer swivelling guide, which moved freely under the weight of the cartridge belt. 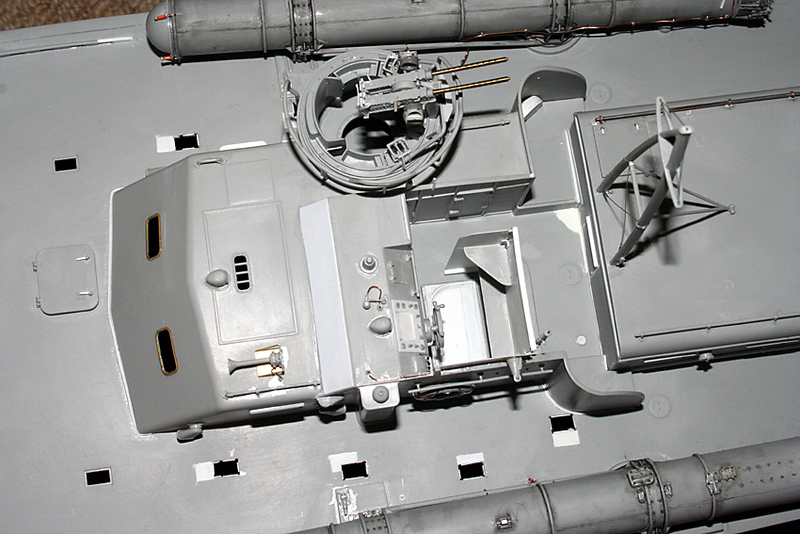 It is usual to see the outer guide horizontal when the gun is elevated. 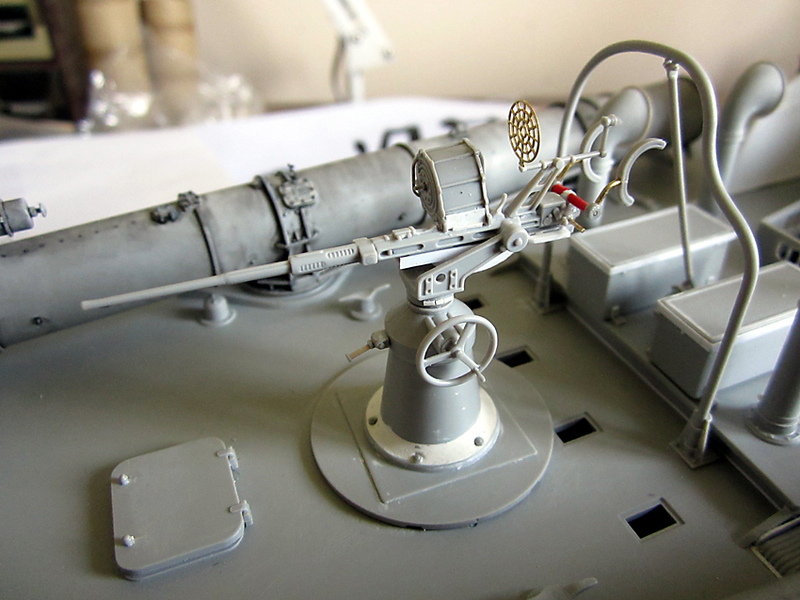 The kit items are fixed in line with the guns, so if you model them elevated with ammo belts fitted they will be at the wrong angle. I initially left the feed guides as kitted, but I have since changed the angle of them by cutting them apart, as I reckon the weight of the roller mechanism alone would be enough to keep them horizontal. This required a scratchbuilt inner collar from tube and some mods to the cradle. 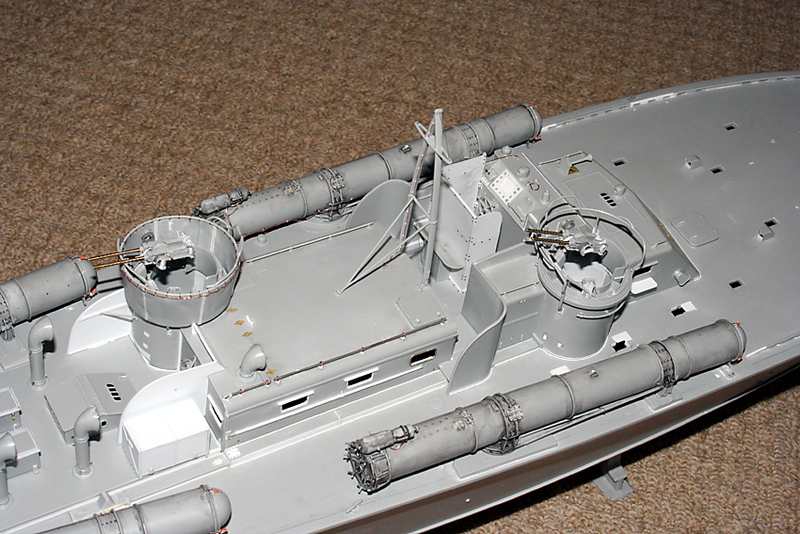 After I had sent the images to Jeff, he noticed that I had missed the fact that Italeri had included their later gun pedestals from the 596 kit. The 103 series boats had an earlier version of a different shape. I tore everything apart again and corrected the pedestals, which had the added effect of lowering the gun cradle a little, which looks better. I intend to add the flexible ribbed spent case chutes at some point, when I can figure out how to best represent them. Some 3D sculpted .50 cal belts are becoming available, so I might give these a try also. As Jeff progressed with his modelling of the day room area and associated structures he brought to my attention that the port side windshield in the Elco drawings is shown the same height as the stbd. 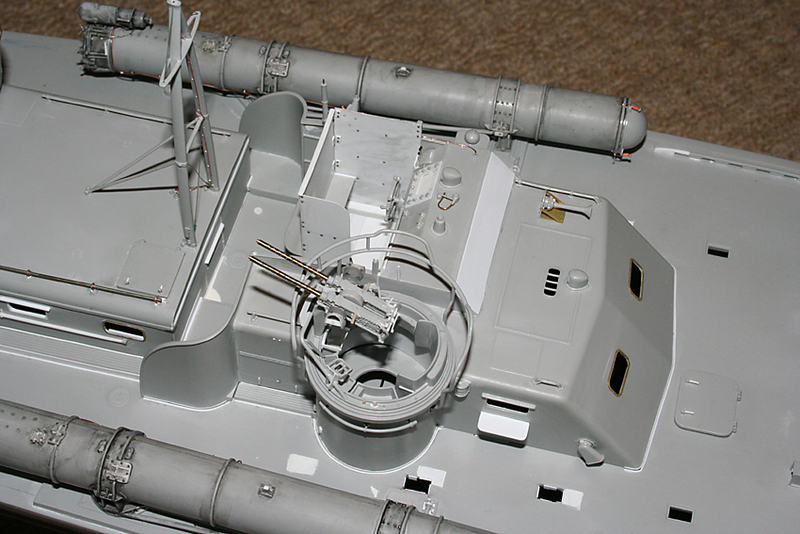 side, but this cannot be, as photos show it meets the turret underneath the gun ring. 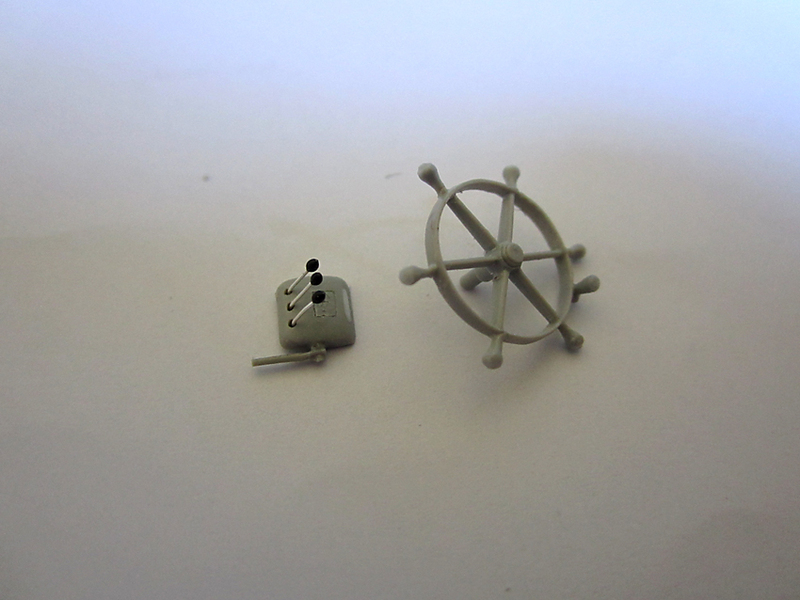 The kit item has a cutout for the gun ring, so needs reducing in height. 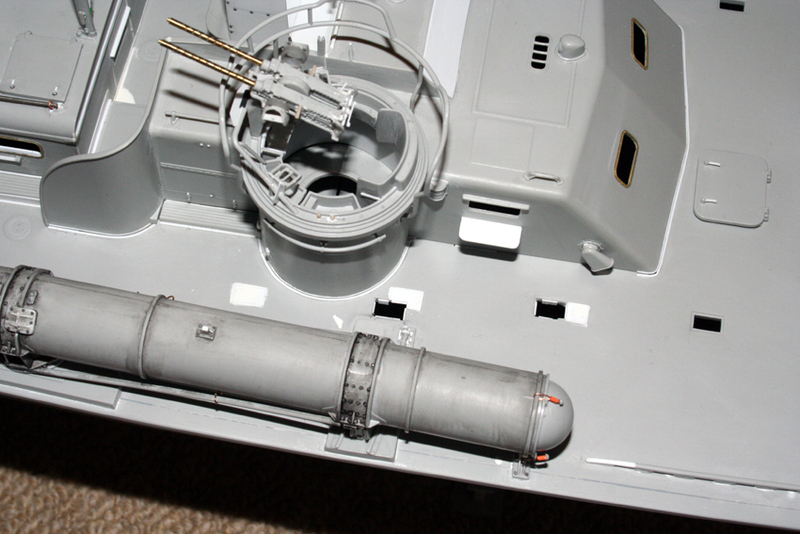 With my attention now drawn to this area, I noticed there was room for improvement in the kit parts. They are commendably thin, but in order that the capping strip looks correct it is only moulded on the outside face of the shields. If you apply strip to the top edge to form the cap correctly it will look too wide. 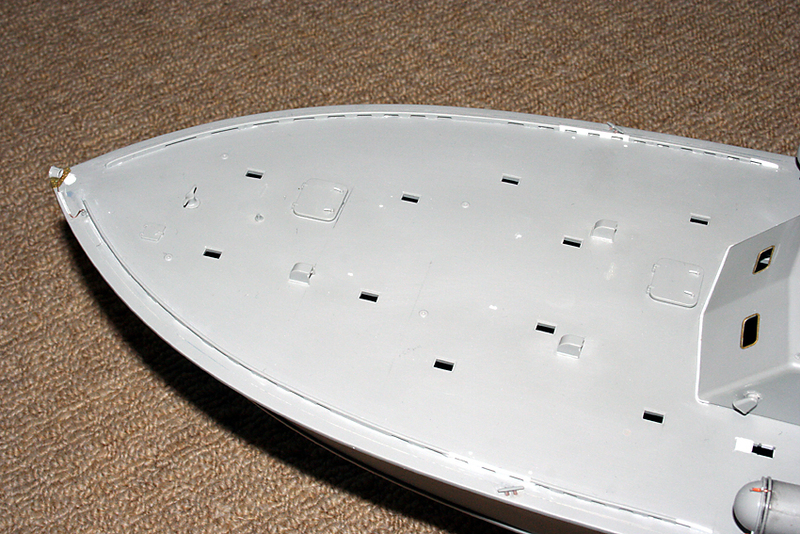 The shields also lack the correct support structure on the inside. In light of this, I decided to make new ones from thin card with correct capping strip profiles and ribs. 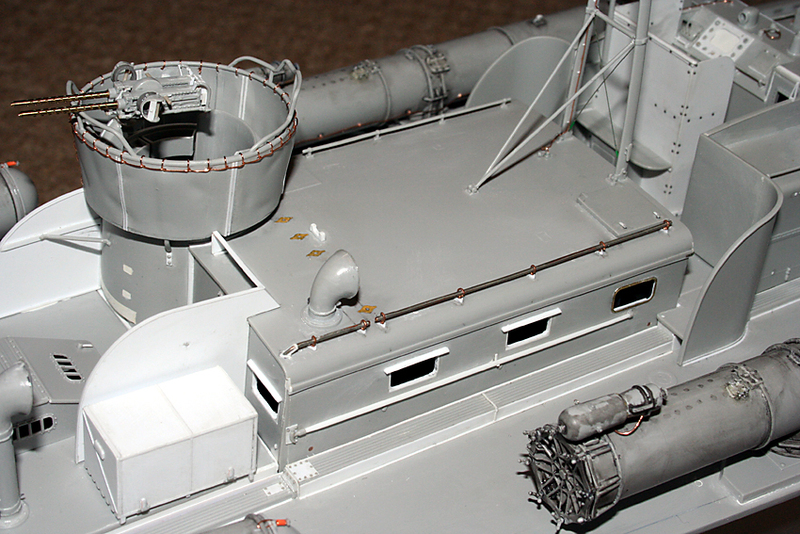 The reinforcing strips on the engine hatch and dayroom roof are incorrect and should be along the inside edge of the shields. The photos show the new parts placed in position before glueing and without the stays fitted. The kit gun is a nice replica of the 20mm and does not need much in the way of improvement. Italeri seem to have confused the different marks of shoulder rest however, and supply a Mk. 5 rest but with the clamps of a Mk. 2, the difference being the Mk. 5 has the clamps horizontal, whilst the 2 has shorter arms with a different fitting and has the vertical clamps as in the kit. Photos of early boats show the Mk. 2 fitted, so I decided to replicate this. I built up new shoulder rest mounts from brass wire. 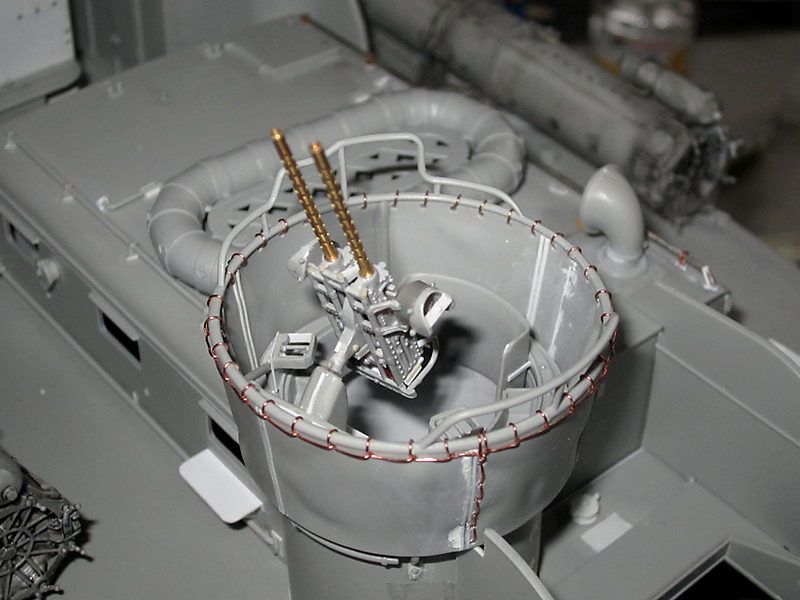 The gun mount was also detailed along with the pedestal and height adjustment wheel. I also plan to make up a spent cartridge bag, and add the back strap. Italeri’s version of the throttle quadrant is a little odd in that it features the three levers projecting from slots in the housing. The Elco quadrant had the levers pivoting from holes in the housing near the bottom. The wheel in my kit suffered from some mould misalignment so was a chore to clean up. I cut off the grips and thinned it all out before putting it all back together. The control panel is supplied from etch, but looks a little flat in my opinion, so I made up a new one from card and profiled rod. Annoyingly, the gauges read incorrectly for a boat at rest, the RPMs should be at zero and the manifold pressure indicators should be in the 12 o’clock position. Well… I tried to ignore them but eventually caved in and altered the windows. The corner radii are too small, they are not deep enough and they look noticeably different from the chart house windows. The inner structures I added to support the clear inserts now look very like the actual window frames. This also gave me the chance to lower the rain strips. There is a strong argument for just fabricating new walls for the cabin if you are in a position to do so. Since I finished the model in the autumn of 2013, Jeff has been completing his virtual model of the day cabin trunk. During his study, a new detail came to light, supported by photographs, that I had not included in my build. Jeff found evidence that the aft, starboard corner of the cabin trunk was rounded off and the facing strip along the roof joint cut back. 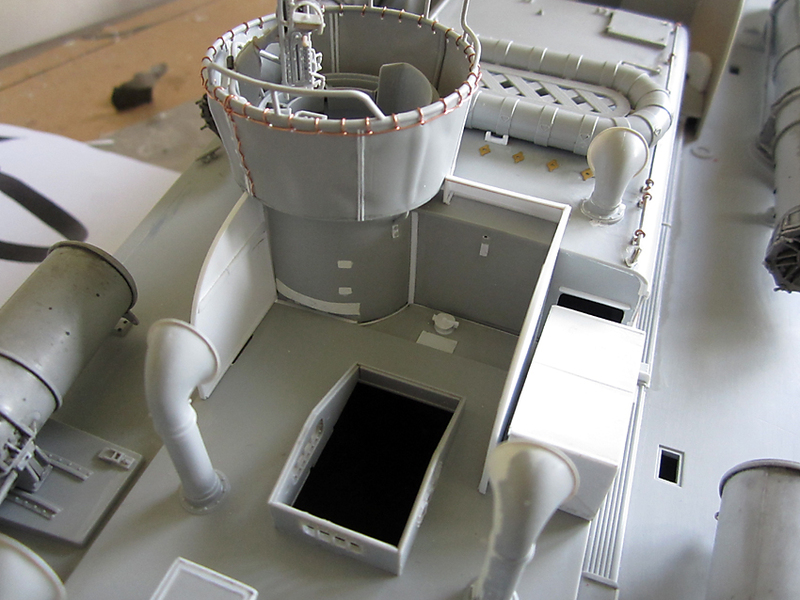 Considering all the work I had put in to get the model as accurate as possible, I decided to try and add this detail. 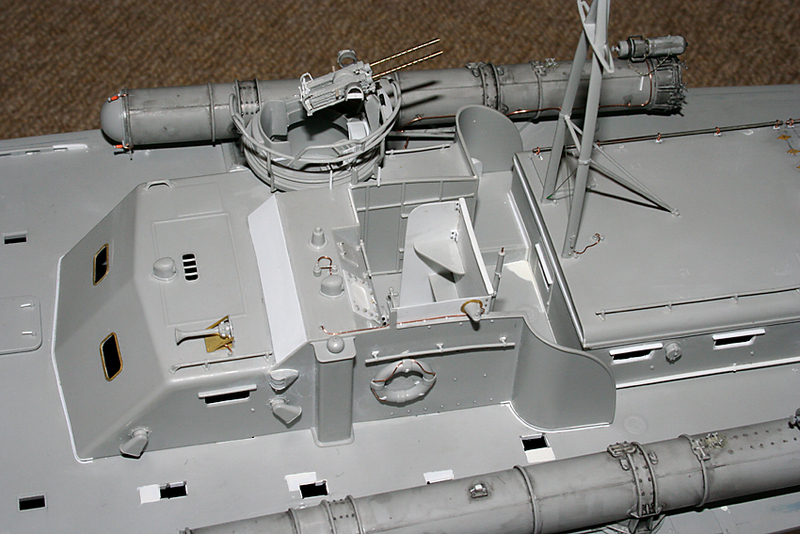 At the risk of causing more damage than it was worth, as best I could I carried out the surgery and re-paint to the cabin corner. With all its windows, I was concerned that some of the interior would be visible. Apart from the ladder, I felt it needed some simple detail just to give the impression that something is in there. I made up a drop in module from card. I don’t think it needs any more than this. 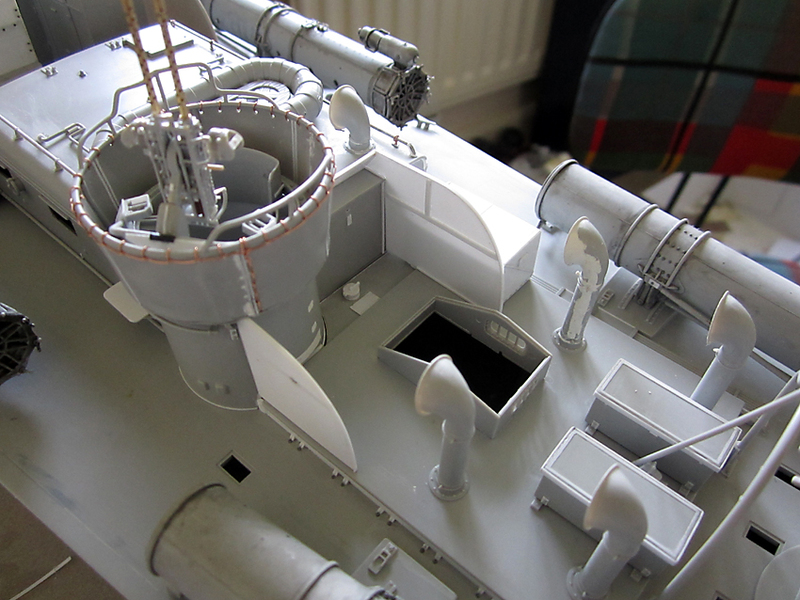 Inside the cabin shell, the turret barrel needs extending to meet the deck. I also added some shutters to the windows and some vertical ribs on the walls. Having gone to all this trouble I am not totally convinced that it is worth it after all. 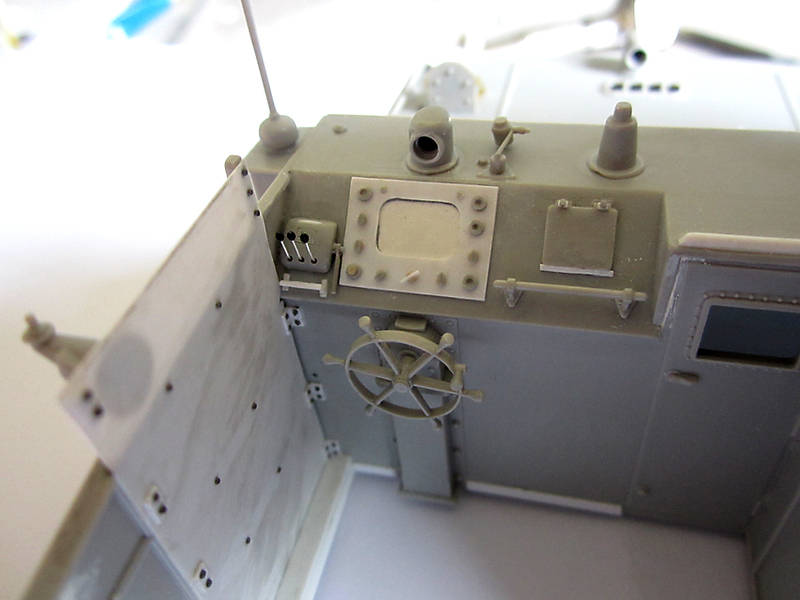 A nice detail to add to the engine hatch are these perforated brackets. I had previously built out the hatch coaming on both sides during the throttle pushrod cover modifications, as it was too narrow. Once again I have to thank Jeff for supplying drawings. Whilst measuring out the locations for the forward tube firing cables, I noticed a dead light in the deck that should not be there. 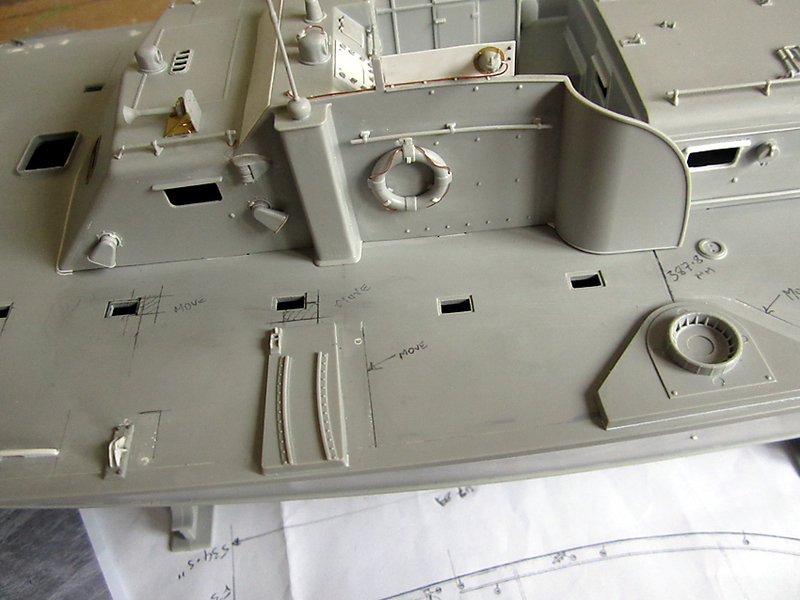 It is the one just aft of the forward turret. 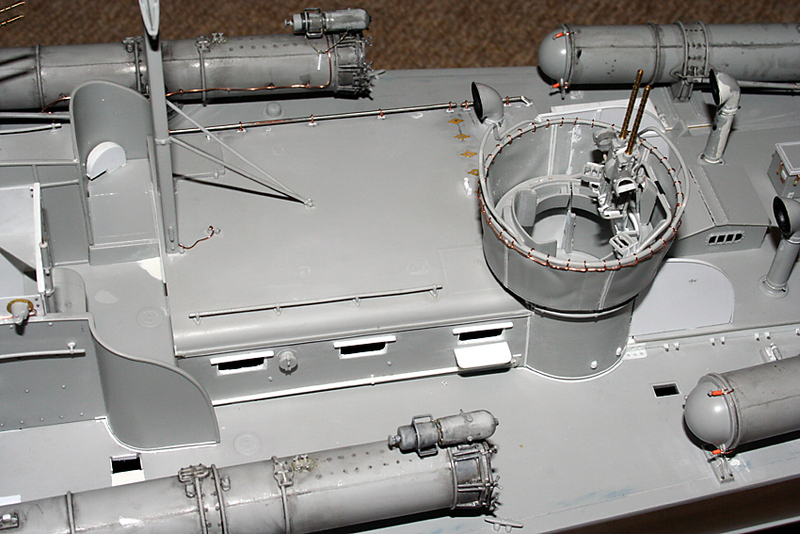 Focusing on this area, I spotted that the next two dead lights forward were out of position and that the forward tubes are set too far aft by about 5mm. 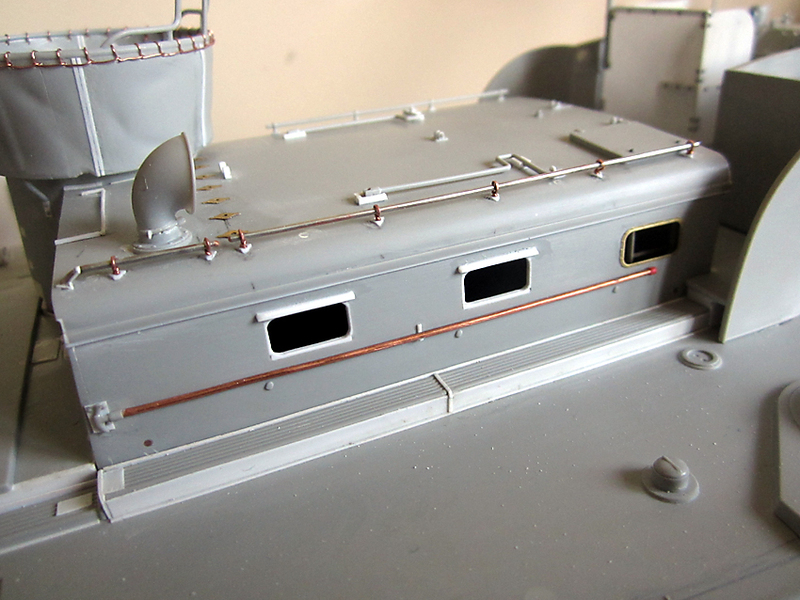 The centres of the main mountings should be on frame 39, which is the forward bulkhead of the day cabin. Measuring from the bow datum, this point is spot on with my modified day cabin bulkhead position. 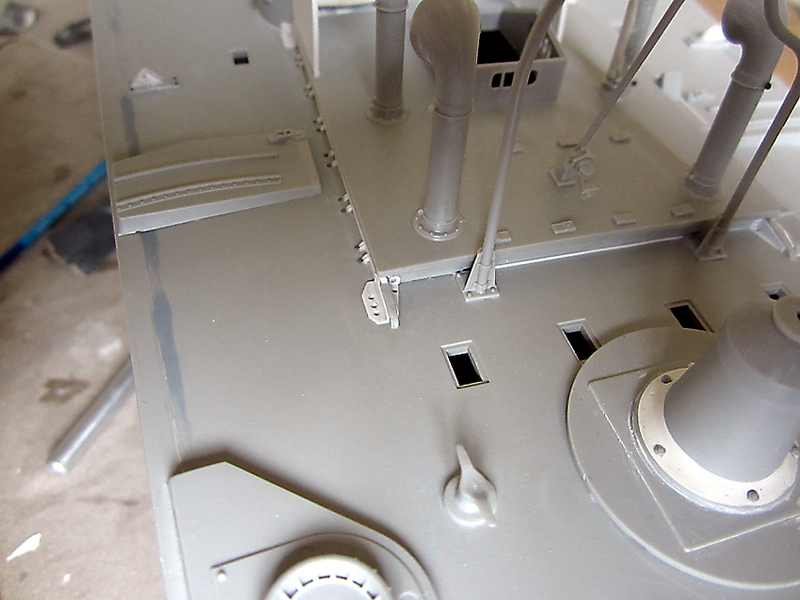 I managed to remove the torpedo mount pads and locking plates without damage, and centred them on this point. 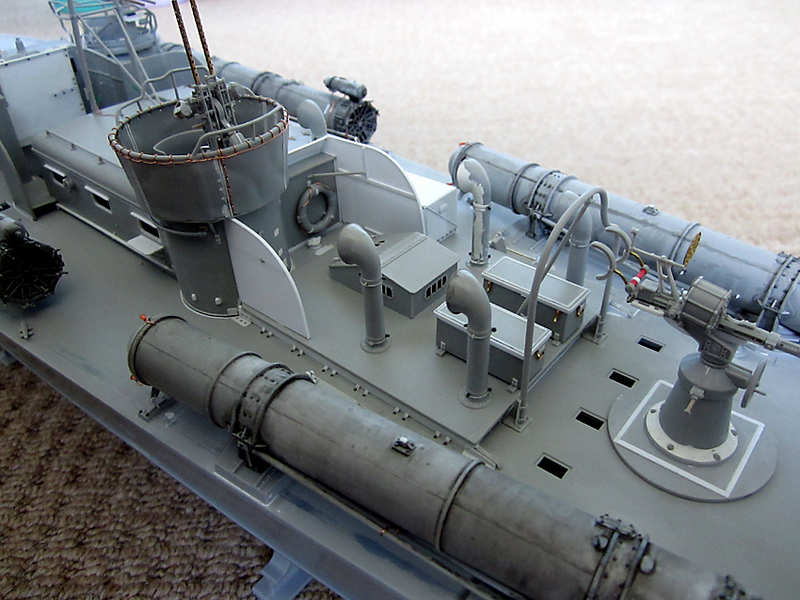 Unfortunately this put the tubes too close to the foot rails on my model, so I have moved these forward a little. I have made quite a few changes to the model since the last update. 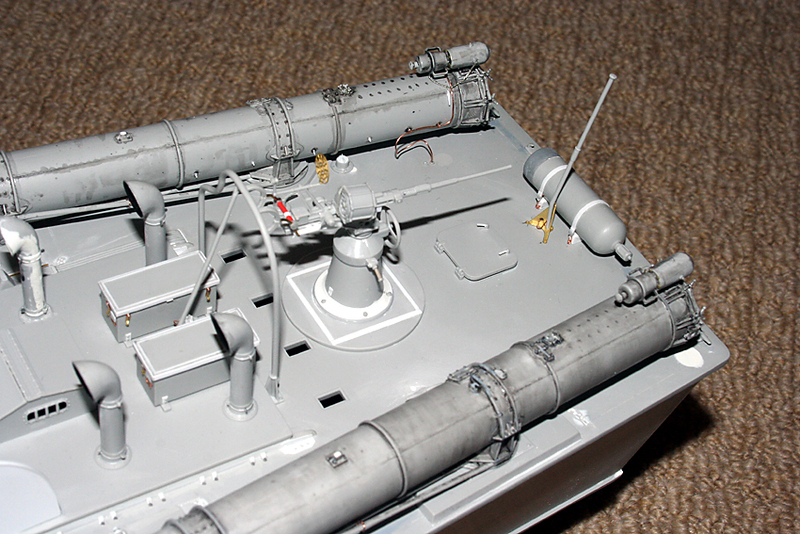 Moving the tubes has also involved moving a lot of (position) related parts including the foot rails. Since moving the forward tubes, I have also moved the aft ones, which put out of position the mooring bitts and aft mushroom vents so there was more work correcting these. 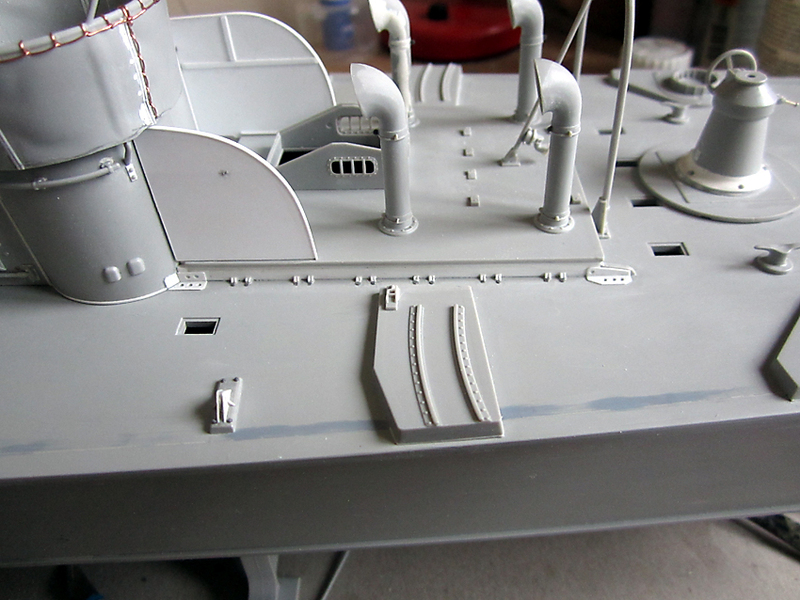 I have re-built and improved some of the hull outlets and vents as they were aligned in relation to the tube pads. I ended up moving six of the deck lights and filling one. As I mentioned at the beginning, this is a work in progress, and as new research material has come to light I have made many changes and additions to the model. One significant change has involved the torpedo training gear. Photos of the early boats prior to shipping overseas show that the torpedo cranking system is of the horizontal type seen on the earlier 77’ boats, and not the 90 degree gearbox, which utilised the speed crank. I went back to the photos of the boats shipping out and noticed that there are no speed cranks visible on any of them. As I had already fitted them, they had to be removed from the day cabin roof. I put this information out to Jeff and David and they could find no photos of the boats at this time fitted with the speed crank system either. We came to the conclusion that this must have been a field modification to the early 103 class boats as Elco drawings of the gearbox are dated May 1942. I have removed the kit gearbox mounts and built the earlier crank system on to the tube pads. As a prelude to painting, I have made preparations for fitting the windscreen glazing. I do not intend to use all of the etch as supplied as most of the plexiglass screen on these boats was fastened down to rubber seals and did not have a frame. Only the corners and centre screen support were on the outside. I have cut out some parts of the etch to be fitted later. So, the model is nearly ready for the first painting stages. The cabins are not glued down yet, to enable the glazing to be fitted last. 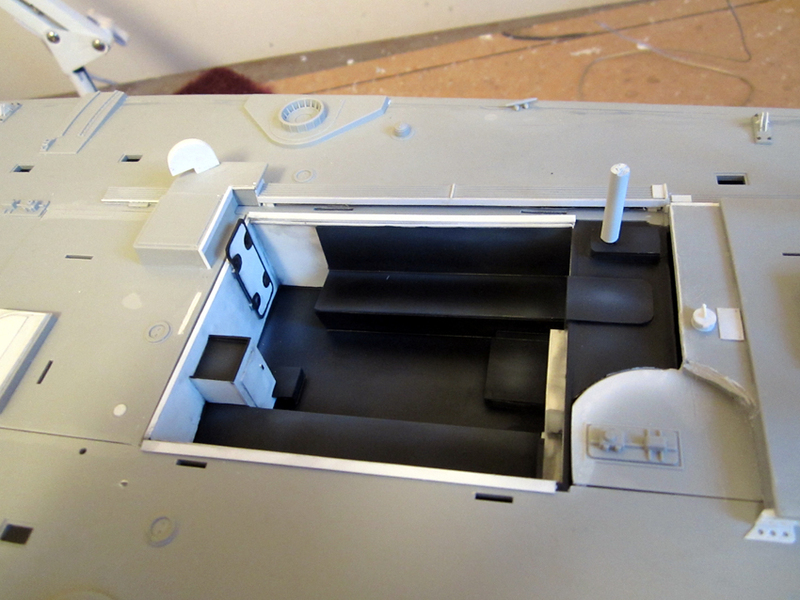 Some details will be added after painting, along with the mufflers and flap pushrods, props and rudders. 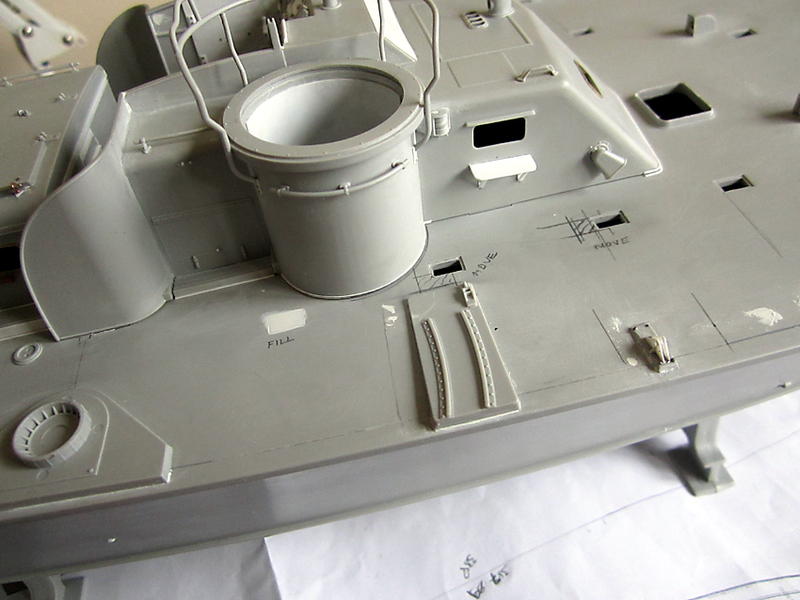 I intend to cast the anchor and bow lights in clear resin, so they have been left off for the moment. 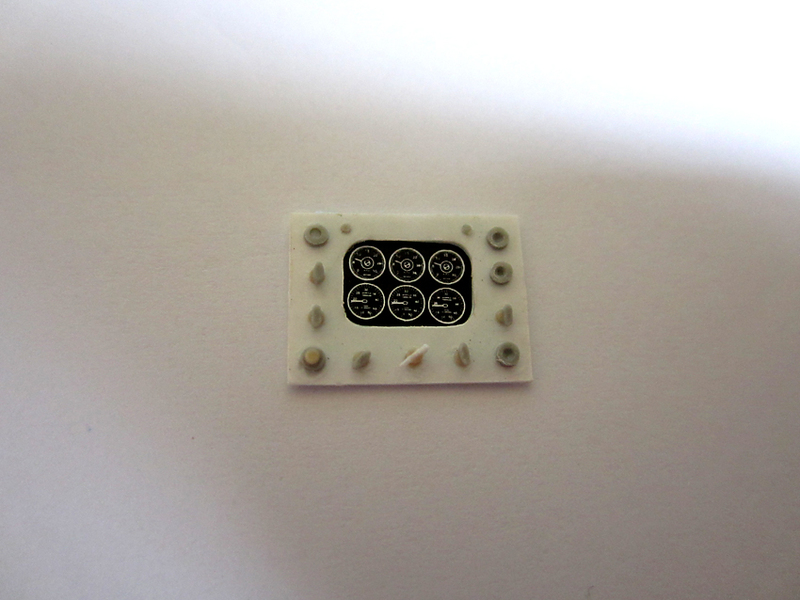 Most of the modifications are clearly visible as white plastic card and strip with copper wire additions as a help to anyone who wants to enhance all, or part of their kit.